There was a time when I really loved running. Well I loved it during those rare times when my body wasn’t in pain, which was not as often as I would have liked. By the middle of 1995, I gave up running. It was just too hard on my 6 foot 2.5 inch body. My first clue that I probably shouldn’t be doing distance running came in 1992. The USA Olympic trials for the Men’s Marathon came to my hometown of Columbus, Ohio. I clearly remember flipping through the program which highlighted the 125 runners that were invited. Only one runner was over 6 foot tall and he didn’t place in the top 3. If 14.5% of all men in America are over 6 foot tall, why were less than 1% of our elite distance runners that tall? Some of us gravitate towards other sports that reward height, but the rest of us just experience too much pain when we run. The past few years I’ve been a regular reader of Conditioning Research, which has had numerous articles on the benefits of sprinting and high intensity interval training. Here are a few examples. Intervals (HIIT) and the Heart – This post is about a study that showed interval training was superior to low or moderate aerobic training for cardiovascular function and aerobic capacity. Exercise and brain health : just sprint for new mitochondria?– Sprinting or interval training may protect the brain from dementia or other central nervous system diseases by increasing mitochondrial biogenesis in the brain. Is sprint exercise a leptin signaling mimetic – By sprinting in a fasted state you could trigger the leptin hormone which controls appetite. A few months ago I got fired up to start sprinting. Right from the beginning I was having pain issues. I adjusted my warm-up and tried to improve my stride. It helped, but whenever I tried to dial up the intensity, something would happen and I’d be sidelined. Traditionally, height has been seen as a detriment to sprinting. The formula for speed is stride length times stride rate. If the longest legs always won the race, then Yao Ming would have the world record in the 100, and lions wouldn’t eat giraffes. Big guys have physics working against them. According to the Journal of Sports Science & Medicine, “[T]he acceleration of the body is proportional to the force produced but inversely proportional to the body mass, according to Newton’s second law. This implies an inverse relationship between height and performance in disciplines such as sprint running.” In other words, it’s hard to produce enough power to overcome the drag of a big body. The article discusses how 6-foot-5 Usain Bolt became an amazing sprinter only after he shortened his stride. But I have no interest in working on my technique or becoming a great sprinter. I just want the health benefits without feeling pain. The problem with running for tall people is the long stride. One way to shorten the stride is to wear minimalist shoes. That is a good start, but the best way I discovered is to just run uphill. Unlike my first two hometowns of Columbus, OH and St. Petersburg, FL, which were were flat as a pancake, Seattle has some amazing hills inside the city. One of those hills just happens to be less than 100 meters from my front door. I’m not the first to figure this out. Conditioning Research also did a post on hill sprints titled The single best exercise. For the past month or so, I’ve been experimenting with just running uphill. My body loves it. My stride is shorter, the intensity is much greater than flat ground sprinting and my body doesn’t take a pounding when my foot lands. And it is time efficient. I’m using Phil Campbell’s Peak 8 protocol as a template. Go all out for 30 seconds and then rest for 90 seconds. Repeat this 8 times. For me this means sprinting uphill and then slowly walking back downhill to ready myself for the next sprint. I’m easing into this program and expect to be at 8 sets within two weeks. I’m running again. Only this time I feel great. Hi Michael, first comment here and it’s a long one – it’s rare that I see something that I’m more qualified than many to talk about: I had no idea that running was such an issue for tall guys until I read this. I’m 6’4″. I was always the tallest kid in my year and I was the fastest over all distances up to 400m at school and competed nationally at triple jump in my teens. I also played a lot of rugby. I’m now in my 40’s and have numerous 10K’s and a half marathon behind me. I sit alongside a chap who is the same height and age who is just preparing for a 100K race. Neither of us have had any more issues than our shorter friends competing in similar events. All the tall guys that I know that have had problems running have also had one other very notable issue: they are all overweight. And being overweight and having pain whilst running is not the reserve of big blokes alone, I suspect. I think the McClelland article makes a very telling point – fast, big guys stand to make a hell of a lot of money in forums other than sprinting or distance running. In the US it’s football or basketball, in parts of Europe and Australasia it’s Rugby (not sure if you’ve heard of Jonah Lomu? 6’5″ 120KG’s and possibly the most devastating winger in NZ rugby, ever). There are few countries that really make idols of their sprinters outside of an Olympic year, and that’s a long time between meals. This statement in your post stuck out for me: “But I have no interest in working on my technique or becoming a great sprinter. I just want the health benefits without feeling pain.” I’m no exercise physiologist so my opinion doesn’t count for much here, all I do know is that whenever I have tried a new sport or exercise, I soon run into trouble if I don’t pay attention to my technique (I’m looking at you, Mr Deadlift). What I’m getting at is that if you want the health benefits without the pain, I suspect you may need to look at your technique. Don’t get me wrong – I’m all for hill sprints and HIIT, and if that helps you get running, then it’s a good thing. I just can’t identify with the idea that running is more painful/difficult for tall people. @Ritchie – Running does place stress on your joints. The longer your stride and the heavier you are, the greater the stress. Some people can recover from stress faster than others. Technique that may be crisp at mile one, maybe sloppy by mile 5 or 20. There are so many variables to account for when running. For me it all comes down to “do I feel better?”. I spent years running. I had people look at my technique. They saw nothing wrong and yet I still hurt. The fact some pro rugby player can beat his body senseless and still thrive doesn’t disprove my experience. Some people can thrive on high levels of training stress. I can’t. So I figured out a hack. The great thing about running uphill is the landing is soft. I feel great after running. I didn’t feel great 20 years ago. My comment about technique had more to do with the fact I don’t need to run to be in great shape. I’m already in great shape. Running is not my sport. It was 20 years ago, but not anymore. For me fitness is first and foremost injury prevention. After that it is about finding the absolute most efficient method to accomplish a task and no more. Point taken. I guess I was intrigued about the discussion about one’s height and it’s relationship to running, given I’d not heard about that before. Sweet Launching Pad! … nice find. Thanks for sharing this. Here’s to getting back to things which you wanted to try again! I know for the folks who I know who were runners they emphasized a proper set of shoes and properly fitted shoes. There are even arguments I’ve read about running barefoot as being in some ways superior. @Joe – I can’t speak specifically to running, but I know personally that moving to minimal shoes was highly beneficial to my long urban hikes. My stride length shortened and my back felt much better. I’ve read similar stories with runners. I do know posture is very important to safe running. Aaron has a post on his site which discusses form. Awesome runway. Do you find much pedestrian traffic on the sidewalk when you run? Does it ever get icy? I like to do my hill sprints on grass, but most of the grassy hills near me aren’t long enough for a full 30 second effort. Hill sprints are my all around favorite work out. Time efficient, intense, and a lot of fun. Glad to hear you are enjoying yours! @Geoff – Very little pedestrian traffic and it gets icy once every 4 years and that was last week! MAS, I’ve had a similar experience with running at 6’1. I want to do distance running and I enjoy it (especially trail running) but it gets to be so painful after a few weeks that I’m afraid I’ll have to stick with hiking to get my fix. How often are you doing your sprint sessions? I’ve done 8x60yd sprints at the football field, but I’ve found that nothing matches the intensity of ‘sprinting’ on a rowing machine, which actual favors people our with our build. 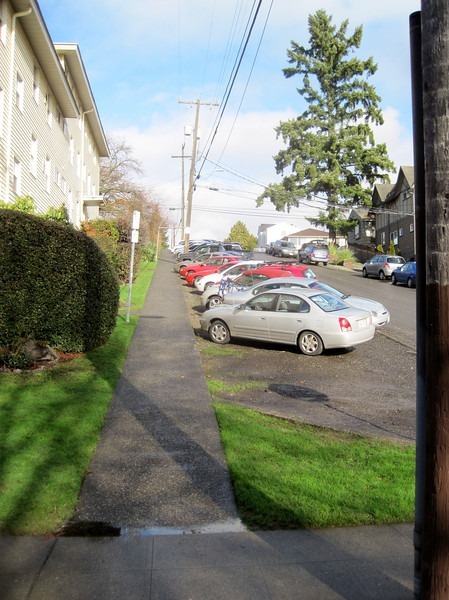 @jto_pdx – I just started the sprinting. I’m hoping to do this 2-3 times per week. The weather has been unpredictable this week. One of our commenters (GWhitney) is a huge fan of rowing. I’m currently gym-less, or I’d give it a try. Indeed – time for me to jump in and praise the value of rowing machines for sprinting! The main benefit is the relatively low impact on the joints, etc. Once you’ve built up (steadily, slowly) a good degree of lower back strenght, you can then sprint on the rowing machines with (near) reckless abandon. Just to be clear – “sprinting” in the normal sense of the word is an ATP-fueled-event, lasting about 30 seconds or less. I was wondering what you think about “walking” as an exercise. I don’t mean sightseeing/hiking or influenced by any other factor (speed, temperature, etc.). My feeling is that unless one is obese and inactive, walking provides little benefit as an aerobic or anaerobic activity. My theory is because everyone walks and everyone is still is prone to heart disease, being overweight, diabetes and such. I also become annoyed when people say walking is great exercise but fail to include those without cars, commuters, and bus takers in their formula. Usually these people work in an office who say this. Is walking for walking’s sake stupid? @Thomas – I don’t consider walking to be exercise, but I do consider it an essential part of being human. I love walking. It is easy on the body and the mind. very pertinent article and the issue of sprint technique for tall guys rings completely true. at well over 6 ft and with a rather lanky/wiry physique, endless pounding of road and track has neve been my forte, but i do enjoy a few minutes’ worth of some short sharp sprints in the mornings. i always run on grass or on un-tarmac’d track, simply miles better for your knees and spine. in terms of technique, my sprinting technique is to run onto and to spring off the balls of my feet and ensuring that my heels have minimal contact with the ground throughout. apart from the fact that this technique is much kinder on knees and spine (i’m in my late 40s and my joints can’t afford that kind of kicking anymore), this technique also automatically shortens your stride without you having to think about the stride length and to compensate you actually find yourself increasing your stride rate. since adopting this technique some time ago my issues with pain and soreness have completely receeded. and needless to say, the older you get the more important it becomes not to sprint yourself into utter exhaustion, but to keep sprint intensity at ca 80%-90% (just short of an all-out effort) and to stop at the point when you feel that you can still squeeze out a couple more – kind of like leaving a good party, always leave at the peak! @GH – I saw that. Seems I stumbled onto what Jamie discovered and that twice a week is a great plan. Thanks for posting the link here. If we are looking at potentially 3 days minimum before the ANS can take another pasting, then we are looking at only two of these sessions per week. I’m really loving your blog. I’ve trained a lot of mixed martial arts and always struggled to find and maintain peak form without feeling exhausted all the time or too sore and get injured. There are many useful things for me in your blog, especially considering we have almost the exact same physical dimensions. I always felt uphill runs worked best for me and now know why. What about stair runs?